RIB Tubes for New Explorer Marine RIBs Sports 600. Hypalon RIB Tubes in Light Grey with contrasting Dark Grey abrasion patches. Contrasting black rubber cleats / grab handles, Contrasting black life line and contrasting black D profile rubbing strakes. 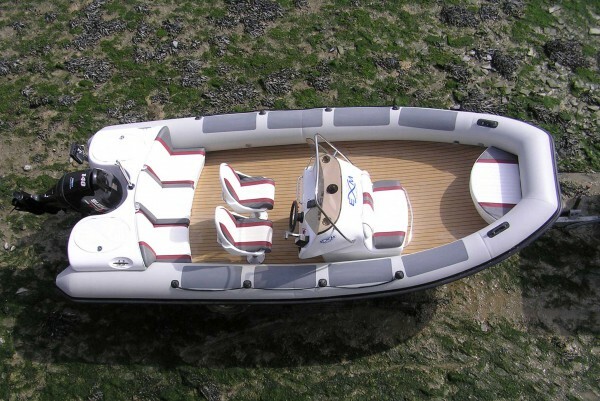 Tilley Inflatables Explorer Marine RIB repair services, RIB Retubing, RIB Retube using Hypalon Fabric, RIB Tube Replacement, RIB Tube Repair, RIB Refurbishment, Seat Re-upholstering.